Small (4-6) - $48.99 Only 5 left! Medium (8-10) - $48.99 Only 8 left! There’s a lot in life we can never fully understand, like why sloths are so darn cute; but here is a fact we can all be clear on: your kiddo will go totally ape when he sees this gorilla getup! But before we go any further, we’d like to know just what is up with the term “going ape,” anyway? Whenever we see gorillas in the zoo, they are usually just sitting around, sleeping, or munching on some food. Sometimes we can't see them at all because they're hiding in the trees, playing coy. Does that sound like much of a party to you? Once we saw a gorilla at a zoo blow bubbles with bubblegum, but that’s not exactly synonymous with letting loose, either. 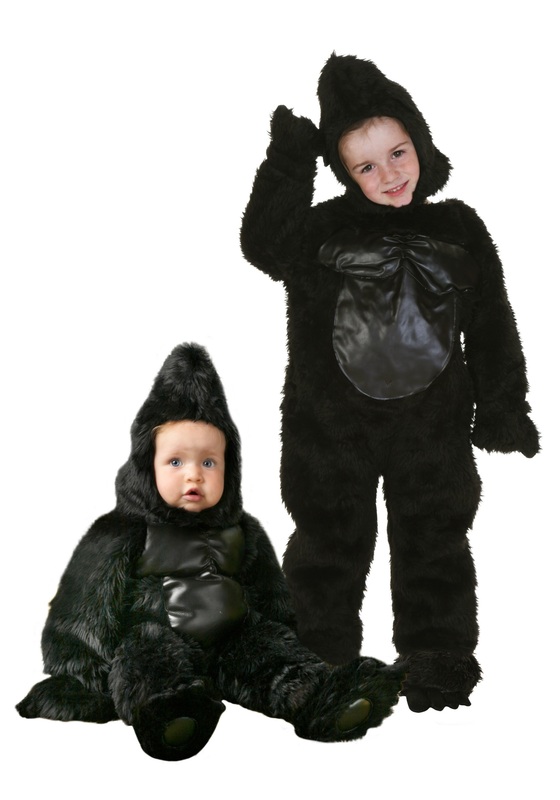 With this Deluxe Child Gorilla costume, however, we think the term may return to its peppier roots. Finally “going ape” can mean partying hard! Here’s hoping, anyway. This costume’s black, furry jumpsuit snaps in the back and is guaranteed to animate your little one. The padded gorilla chest is just perfect for pounding when your tot is ready to go bananas, and the attached hand covers provide the option for hand warmth in colder climates. The matching headpiece secures under the chin so he can go wild around the neighborhood without losing his head. Now if only gorillas were marsupials, he’d have a perfect place to keep all his Halloween candy; why is it only some animals get those cute little pouches? Another of life’s unsolvable mysteries!